It’s May and I want to dream about picnics and cooking outdoors. We thought summer was well on it’s way when temperatures climbed into the 80s a couple weeks ago, then we were startled with the cold front that came through yesterday bringing lots of rain and dropping temperatures back into the 40s. Everything is damp and the chill in the air makes for perfect soup weather, especially if it’s a little spicy like this one I warmed up for lunch. 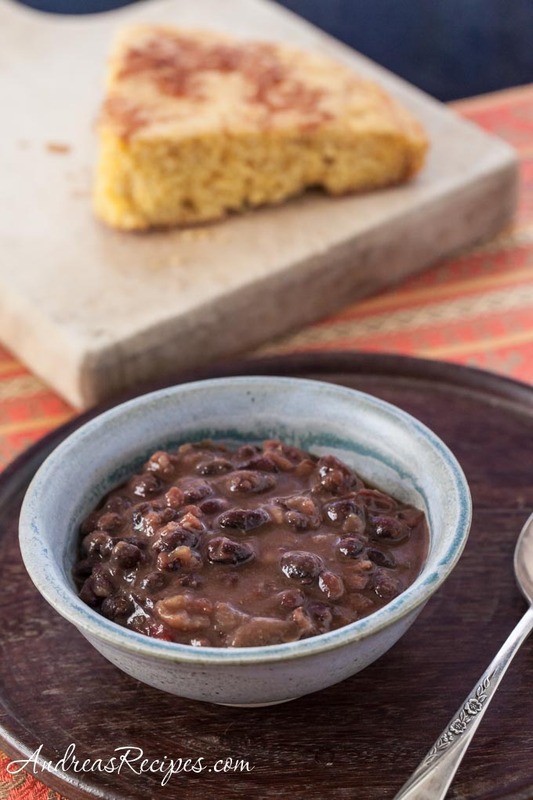 It tastes great with a slice of cornbread on the side or crumbled in the bowl, and makes me feel all warm inside. I needed that pick-me-up as I watched a river run through our backyard, cutting a swath in the garden. At least it wasn’t in the house! Maybe the mud pit will dry out enough that we can finish planting this weekend. 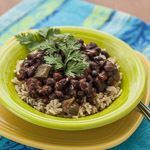 I like to make this black bean soup in the slow cooker because it is so easy for a busy day, or even for overnight. The ham bone goes in for lots of flavor, but if you want a vegan option then skip the bone and use a rich homemade vegetable stock instead of water. Also, if you add the salt late rather than the beginning of the cooking process, the beans will be more tender, so hold that salt! I almost forgot! Susan of Food Blogga is hosting a great event in honor of National Osteoporosis Awareness Month called “Beautiful Bones,” promoting calcium-rich foods that fight osteoporosis. My soup has calcium-rich black beans, tomatoes, and black pepper. If green or spicy peppers were rich in calcium this would be even better! Make sure you visit her blog for the round up in early June. The night before you make the soup, pick through the beans and remove any bad ones. Put the beans into the pot and add 2 quarts of water. Remove the beans that float. Allow to soak overnight. Drain. Place the ham bone in the bottom of the slow cooker pot. Add the soaked beans, all the peppers, onion, tomatoes, chili powder, and garlic. Add water, just enough to cover everything. Put on the lid and cook on high for about 6 to 7 hours or on low for 9 to 10 hours, until the beans are tender. About 1 hour before serving, add the salt and fresh ground pepper. Stir and put the lid back on. Turn off the heat and ladle into bowls. Serve with cornbread. Vegan: Omit the ham bone and use a rich vegetable stock instead of water. Crisper peppers: The peppers and onions will be very soft after a long cooking time. If you prefer a bit more snap in your soup, hold them until the last hour or so of cooking. andrea, this is a fabulous recipe. i’m always looking for a black bean soup recipe to top my favorite, and this one definitely has that potential! 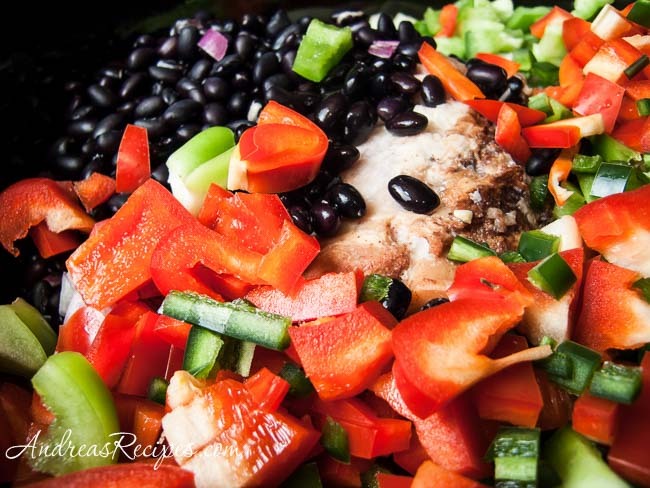 Ohhhhhhhh you know how to get my attention… I just love black beans recipes!!! And black bean is one of my favorite soups! We’ve been dipping up to 90° but just now it’s been cooler and I had to make a nice bean stew to celebrate a respite before the heat stays. grace – Thanks, I hope you like it. Cris – I love black beans in just about everything. 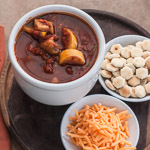 MyKitchenInHalfCups – I think now that the cold front has passed the heat is here to stay, too. This looks so yummy that I think I’m going to make it tomorrow. Slow cooker means it won’t heat up my kitchen. Yum!!!! I love using black beans. Also, do you have great recipes for good picnic food? My mom swears by adding a ham bone to bean soups. She said that what gives it its bold flavor. And I’d definitely have a bowl of your soup with the cornbread–it sounds like the perfect pairing. Thanks for a healthy and hearty entry, Andrea! PS-I hope your back yard river dries up soon. We used to have a river when we lived in NC too, so I know how you feel. This is a great recipe! I love black beans along with ham. Thank your for this recipe. You mention in the intro that it includes tomatoes but they’re not listed in the recipe, where do you add them? Is it canned diced tomatoes at the start or just diced fresh tomatoes as a garnish? Sounds good though, I can’t wait to try it, I’ve been dying to use my ham bone in the freezer. Sunny, thanks for catching the omitted tomatoes. I’ve added them to the ingredients list and in step 2. Actually I changed this black bean recipe a bit. Only using a Jalopeno since I don’t do spice well, dropped the Anaheim and Chipolte pepper out. I added two ham hocks since I am a southern boy along with the ham bone. Rather than soaking overnight, I poured boiling hot water to 2 inches above the beans to soak at least one hour or until they swell twice their size. Keeps them firmer and holds their shape better. This looks wonderful. Can I substitute chicken broth for the water to cover everything before cooking? Hi Jennifer. Yes, you can use chicken broth if you prefer. Hello … never made bean soup, but have a ham bone and decided to try it. Question, at what point do i remove the ham bone? It should be removed before left overs are refrigerated right? Hi Suzanne! Yes, once the soup is cooked you should remove the ham bone before refrigerating any leftovers. Hope you enjoy it. I’m getting more and more used to spicy food and have enjoyed bringing this up to its full heat level. I was a real wuss when I first tried it. Now, since it’s hard to obtain chipotle chiles from my grocery store in Ohio, I’ve been subbing not only a can of Rotel tomatoes and green chiles, but sometimes add a dried birds-eye pepper — which I remove when done — to add more heat. I also use two jalapenos instead of one… again to sub for the missing chipotles. 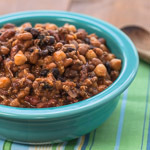 It is so good to find a recipe like this which is healthy, easy, and uses mostly what is normally stocked in my kitchen. Thanks!